Ask any artist: What prevents you from making art? The most frequent response is: I don’t have enough time. Artist friends have at least 2 (often 3 jobs): a life job and an art job. In their life job, they have families to care for, shopping lists to make, homes to repair, cars to maintain, taxes to finish, and 40+ hours of paid work to perform. In their art job, they have shows to view, work to install, competitions to enter, financial books to keep, press releases to write, address data bases to maintain, supplies to purchase, and of course, art to create. Leap Years come every 4 years. It’s a gift from the Universe. The Egyptians were the first to come up with the idea of adding a leap day once every four years to keep the calendar in sync with the solar year. Later, the Romans adopted this solution for their calendar, and they became the first to designate February 29 as the leap day. So, on February 29, I had great plans to work on the design for the library sculpture. I hung up a sheet of blank paper, wedged some clay, and waited for inspiration. Julia Cameron, author of the Artist’s Way: A Spiritual Path to Higher Creativity, believes you just need to make the time to make art. It’s like exercise: just schedule it. But, creativity is harder to schedule. It doesn’t like to be pigeonholed into showing up at a particular time. After a while, you learn when the Muse has decided to take a day off. So there is nothing left to do except “prepare” for her return. Sometimes it helps to read art books. Sometimes it helps to look through your sketchbooks. Sometimes it helps to just stack wood, sharpen tools, and retrieve your compressor. A friend offered to “store” the compressor while he worked on the roof of his cottage. At some point, it just “stopped working.” There was no one the island to fix it, so it became a kind of lawn ornament. The summer ended. My friend closed up his cottage, loaded his truck with his tools and my compressor and headed to his upstate New York home. I didn’t have plans to carve any stone, so there wasn’t any hurry to repair it – or so I thought. A month later I was awarded the commission for the library. Now there was a sculpture to carve and a deadline to meet. So, he dragged the compressor to various NY repair shops, doggedly determined to salvage it. After many unsuccessful forays, he found just the right guy and after paying $1.79 for just the right part, the repair problem was solved. It takes almost as long to drive to upstate NY as it does to Maine and with the increase in gas prices, it was clear where I WASN’T going, but I needed my compressor to come to me. SOON. I received an email from a friend looking for overnight accommodations on her way to a D.C . conference. She lives in Albany. She drives an SUV. Throughout our years of friendship, she has participated in the schlepping segment of my art life – more times than I can count. It seemed only fitting to offer her the opportunity to chauffer the compressor to Maryland. They lived within 5 miles of each other. 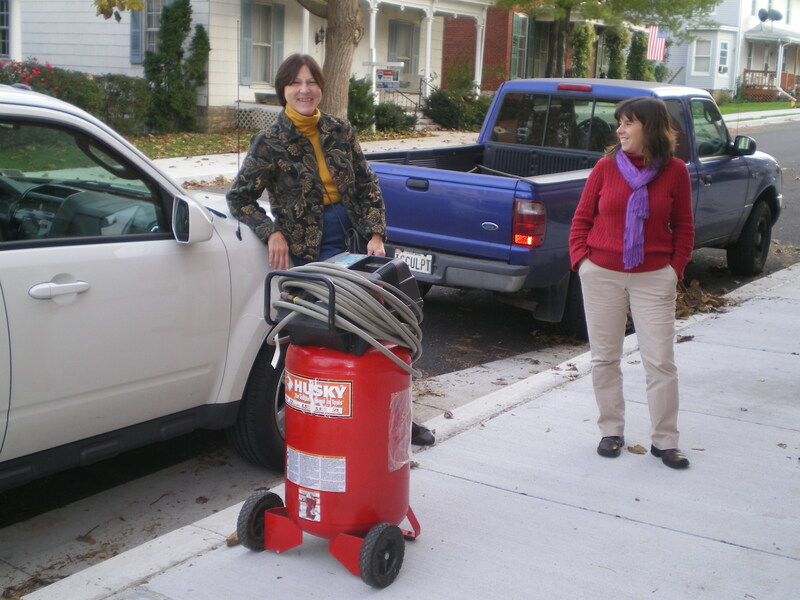 He tucked the compressor and reel of 50 foot hose into the back of the Lexus and she was on her way. I hope you got a few extra hours of sleep on February 29, because we lose an hour this weekend. It’s daylight savings time. There are a million reasons why artists don’t make art – no money, no time, no heat, no inspiration. However, the most frequent reason for making art is a deadline and I have one. I have a maquette to make for the Library Design Committee. I really need that Leap Year day now.